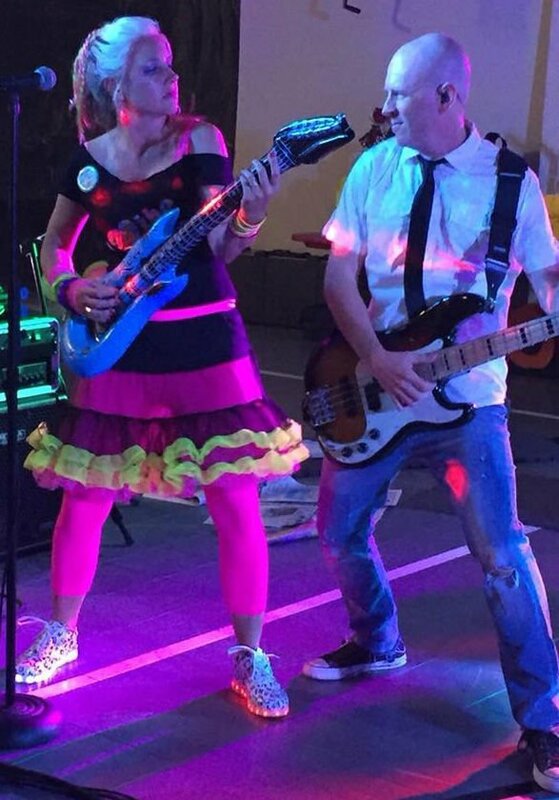 A Warmer Day Vice President Heather Graewe plays an inflated guitar on stage with the AM/FM band. 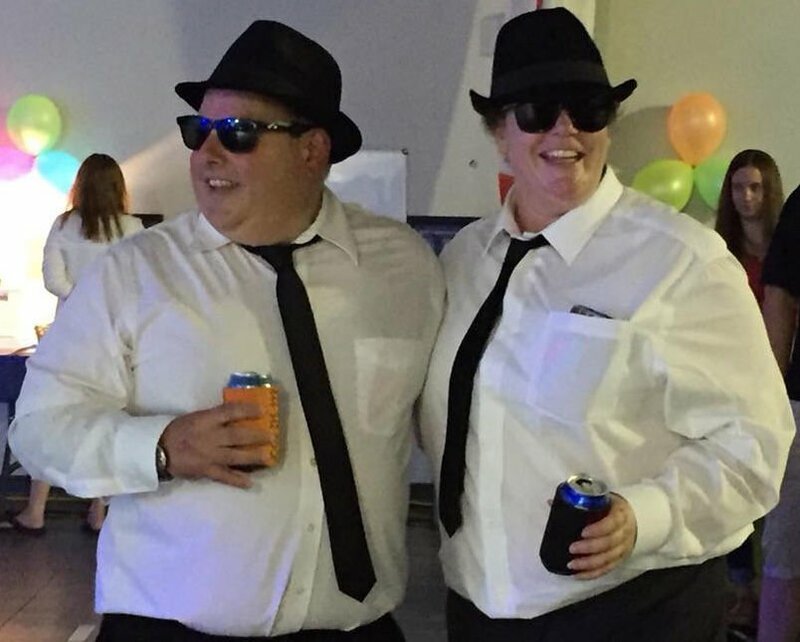 (From left) Ron Nachtman and Shelly Mousseau enjoy the evening in costume as the Blues Brothers. Marcia Elfring, Shelly Mehuron, Jenna Garrow, Michelle Nesbitt and Tanya Strayer enjoy the "Back to the '80s" fundraiser for A Warmer Day. "Back to the '80s" was the theme for A Warmer Day's second annual Big Summer Fundraiser July 21. Many in attendance arrived dressed as their favorite icons from that fabulous decade. Guests were treated to a live performance by AM/FM, an enormous silent auction and a wide selection of food. According to A Warmer Day’s Founder and President Dave Conde, more than 350 guests attended the event. Conde added that the event would not have been possible without key sponsors such as CIP, BB Roofing, Innovative Homes & Design, Lasting Improvements and media sponsor ESPN Radio 1480AM. He expressed appreciation for all supporters and sponsors who make A Warmer Day's work possible. A Warmer Day is a local charity with a mission to provide coats and other winter apparel to Nebraskans in need. It is an all-volunteer organization and has distributed more than 13,000 pieces of winter apparel in just two years. Since A Warmer Day has no payroll, all funds raised from this event will go directly toward the mission to help underprivileged children and families. A Warmer Day serves all of southeast Nebraska and has distributed needed winter clothing in Lincoln, Omaha, Nebraska City, Beatrice and many other towns in the area. To learn more about A Warmer Day, see awarmerday.org.